Summer is here! And while you’ve been preparing your body for the warm weather with lots of exercise, eating nutritious foods, and learning to reduce your stress, there’s one aspect of your appearance you should focus on the most: your smile. With weddings, vacations filled with lots of photos, and graduations, it’s important that your grin accurately reflect your bright and brilliant personality. That’s why you should try teeth whitening from your dentist in Friendship Heights, Dr. Yelena Obholz at Aesthetic & Family Dentistry of Washington. Learn more about the affordable options that can give you the radiant grin you deserve. ZOOM! – This is a remarkably quick way to lighten your teeth by up to ten shades. Dr. Obholz will start the process by protecting your gums and lips, then she’ll apply a potent, yet safe bleaching gel that will be activated by a light. You’ll sit back and let the treatment work its magic during a course of three, 15-minute back-to-back sessions during one appointment. In just 45 minutes, you’ll have amazing results that can last anywhere from 3-10 years with proper care and maintenance. At-Home Kits – Perhaps you’d like to whiten your teeth from the comfort of your own home? If so, our custom-fitted trays will give you the convenience factor you’re seeking. Just apply the gel to the trays and wear them for a short period of time each day and you’ll be impressed by the results you’ll obtain in 1-2 weeks. Our kits are superior to over-the-counter options for two reasons: first, the trays will keep the gel in contact with your teeth only (making sure saliva doesn’t mix with it and lower its potency), and secondly, the professional strength gel provides results that OTC strips, pastes, and rinses just can’t give you. Can I Afford Teeth Whitening Services? Absolutely! We aim to make the perfect smile available for every patient. 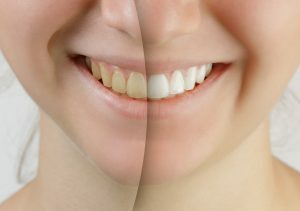 Teeth whitening treatments have become remarkably affordable in the past few years, since this is the number one cosmetic dentistry procedure. We offer CareCredit financing for those interested in low, monthly payments and have specials available to give you a discount on your smile upgrade. So, what are you waiting for? If you’re ready to for your perfect smile, schedule your appointment for teeth whitening in Friendship Heights with Aesthetic & Family Dentistry of Washington!